Abu Ali Mustafa is a Palestinian leader and martyr, a symbol of steadfastness and persistence through all of the stages of the Palestinian revolution. Assassinated on 27 August 2001 by a US-made and provided helicopter-fired missile at the hands of the Israeli occupation military, Abu Ali Mustafa’s life as a revolutionary was cut short amid the rising Al-Aqsa Intifada. However, his legacy and his school live on today. From the Abu Ali Mustafa soccer tournament in the Palestinian refugee camps in Lebanon, to the Abu Ali Mustafa elementary school in Arraba, his hometown near Jenin, to the Abu Ali Mustafa Brigades, the armed wing of the Popular Front for the Liberation of Palestine, his name lives on, a testament to the declaration that those killed for a just cause become “immortal” in the lives of the people. It is not merely through his name that Abu Ali Mustafa, however, continues to leave behind a legacy as a Palestinian revolutionary. A fighter, a strategist, a struggler, General Secretary of the Popular Front for the Liberation of Palestine. What did Abu Ali Mustafa stand for? Uncompromising struggle in the face of injustice and oppression. A clear, revolutionary, internationalist vision. A global struggle against capitalism, racism and imperialism. All forms of struggle to achieve return and liberation, that always centers the working class, the oppressed, the refugees. A liberated Palestine for all. And it is that vision which continues to inspire generations of strugglers to march carrying Abu Ali Mustafa’s image: not only his image, but his vision and his goal which remains ours: for return and liberation, for socialism and revolution. 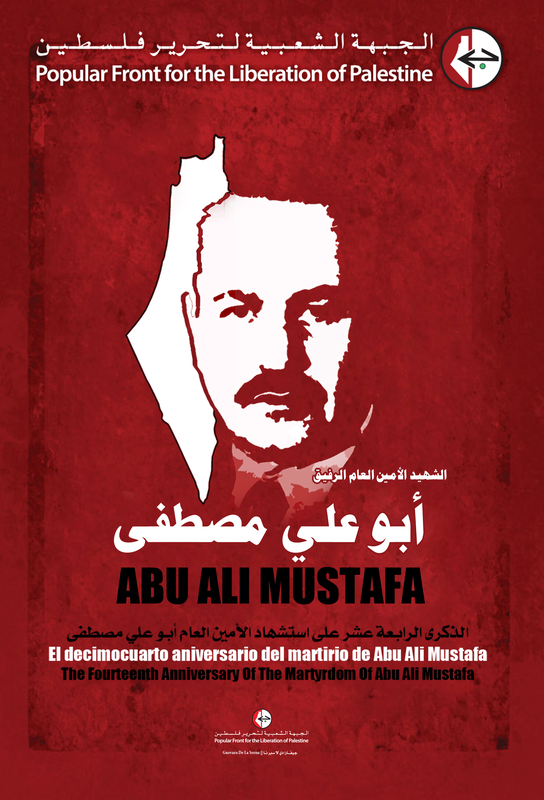 This website aims to document, build on and celebrate the legacy of Abu Ali Mustafa: the ongoing, present and future Palestinian, Arab and international revolutionary movement of the Left that continues to march for liberation. We welcome new materials, videos, photos, essays and writings and materials about, by or inspired by Abu Ali Mustafa. Please contact us using the form – or at contact@abualimustafa.net – to add these materials to the site.